New patients at Hamlin Dental Group can take advantage of two new promotions. Finding a new dentist can be a big job, especially for patients who are due for their biannual checkups. Regular dental care is associated with better overall dental health and earlier diagnoses of dental problems. Hamlin Dental Group offers comprehensive dental care for patients of all ages under one roof, and is now welcoming new patients with some special promotions. Most insurance plans are accepted, including Medicaid, and Hamlin Dental Group offers financing for qualified patients. During a checkup, Dr. Reza, Northridge dentist, will perform a visual examination of a patient’s teeth and gums to check for any signs of dental problems. He may take a dental and medical history and ask about any medications, vitamins, and supplements you take. Digital X-rays are used to spot abnormalities between the teeth and below the gumline, and can also identify issues in bone structure, tooth roots, and other areas not visible to the unaided eye. Professional cleanings are recommended every six months for most people with healthy teeth and gums. 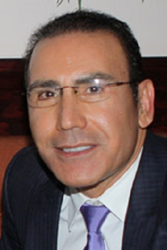 Dr. Hamid Reza founded Hamlin Dental Group in 1994. Since then, he has expanded his practice to the Northridge and North Hollywood areas, and provided families with comprehensive dental care, including dental surgery, cosmetic dentistry, preventive dentistry, and general dentistry. He is a member of the American Dental Association, the California Dental Association, and the San Fernando Valley Dental Association. Dr. Reza works with a team of highly qualified dentists and dental specialists, including Drs. Aminian, Garemani, Koshkerian, Vafadar, Wang, Woo, and Yessaian.